Ms Blair recommends: Question One! "How do I become a children's writer?" Question One! "How do I become a children's writer?" I've had my first question sent to me! I've sent off a very hurried email in response, as follows, but I bet there are lots of writers for children out there who might want to put their two-cents worth in. One thing I couldn't find was information about any courses currently running if you want to write for children. Any ideas? If I wanted to develop my own ability to write children’s stories, what would you suggest that I do? If you want to write for children the two most important things are to read and to write. Writing regularly is the best way to get better. Keeping a notebook with ideas, be they big or small, or noting down something someone says, they all go together to build you a good ideas and content bank. Once you’ve got some writing done and put a story together – (you don’t say what sort of thing you’d like to write – picture books, junior novels, YA, non-fiction? I can give more specific advice depending what you have in mind) it’s a good idea to send it to a manuscript assessor. There are lots of good ones around (http://authors.org.nz/list-of-assessors-and-editors/), again let me know what you’re writing and I’ll recommend someone for that genre. You will need to pay someone to do this and it’s well worth it as they will give a professional opinion. It’s much better than asking friends and family to give their opinion about your story, it’s pretty much impossible to be objective about the work of someone you are close to. You can join the NZ Society of Authors (the link above is from their website) which will keep you up to date with workshops, competitions etc. There are a number of writing groups around which can also be beneficial. Everyone shares what they've been writing and critiques and encourages each other. The JC and TF awards are sponsored by Scholastic and is the only channel through which they will look at new writers, they no longer take unsolicited manuscripts. Storylines is an organisation it would be worth your while joining, both as an aspiring writer and as a parent. They run a national festival of children’s writers and illustrators at the end of August, including big family days where you can go and hear authors and illustrators talk about their work and ask questions. They usually have workshops too, sometimes for adults. Every chance you get to do something like this it’s good to take it up if you can. You’ll get to know other writers and the many tricks of the trade. 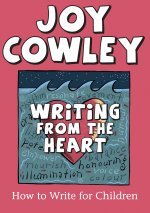 Storylines also sell a great book about writing for children, by one of our best children's authors, Joy Cowley, called Writing from the Heart. Hi Chrissi, I hope you don't mind me posting that Whitireia run an awesome online module Writing for Children. It covers fiction and non-fiction, picture and chapter books and is a great 'starter'.